I have a little saying, "I don't discuss bedrooms and bank accounts." Meaning what you or I do in those two areas of our lives are private. The end. Bathrooms should really be included in that too since we don't need to share, ahem, each other's inner workings, but Charmin has forced my hand a little. I was sent a box of their freshmates to review. Which means I have to write about bathroom stuff. Oh boy. As this blog is *mostly* about being practical, let's focus on that side of things shall we? When things get messy, dry paper towels don't really do the trick. We use wet wipes to clean up dirty messes on kiddos' faces and hands. We use baby wipes to clean up messes on the other end of the spectrum. So it makes perfect sense for adults to use wet wipes to clean up instead of just dry toilet tissue. Freshmates are gentle for sensitive skin and leave you feeling clean. Often there are coupons available for freshmates which make them reasonably priced. 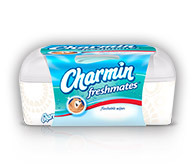 Charmin is hosting a sweepstakes for a DIY bathroom makeover. All you have to do is send in a photo of your bathroom and upload it to the site. I was sent a free sample from Vocalpoint for my review. All opinions and hangups on what to talk about in public are my own.